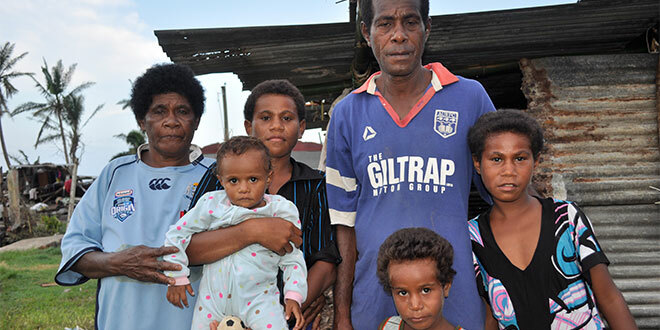 Mourning: Cyclone victim Sera Tinai’s husband Patemosi, her mother Mereoni and four of their nine children. Sera was killed during Cyclone Winston. AS Fiji’s clean-up after Cyclone Winston continued with international support, there are painful and tragic stories of the night the storm struck, claiming 42 lives. Cyclone Winston tore through on February 19, with winds of 330km/h devastating the region. The village of Oelekuro, a remote community of 400 in the province of Tailevu, is still reeling from the extensive damage and is also mourning the death of Sera Tinai, a 41-year-old mother of nine. The story of her bravery and sacrifice on the night Winston struck, was told to John Pickering, who works for the Archdiocese of Fiji and visited the village and the nearby Catholic Mission of Natovi. “Tinai was known to all in the village as a fun-loving person who took her responsibilities in the village very seriously,” he said, after hearing her story recounted by mourning villager. A mother of nine young children, she was known to place their needs and her extended family before her own, including her youngest child, a 14-month-old. “This child will grow up never knowing her mother except the stories that she will hear of how her mother against all odds at the height of Cyclone Winston, took her children to safety and returned to their home to collect a bagful of clothes for each of them. “With the bag strung around her arms she tried to make her way back to her family. “Her own family home collapsed pinning her to the ground. “Weighed down by one of the beams of her own home she lay trapped and unable to move. “The nearby river burst its banks and flooded the village. At the same time, there was a tidal wave. “As the tidal wave rushed to cover the village with a destructive fury, it combined forces with the waters of the burst river bank. “Pinned beneath the beams of her own home and unable to move, Sera Tinai drowned beside her own home. “She was found later that evening as the villagers mounted a search for her. Sera Tinai is survived by her grieving husband, Patemosi, who found his wife pinned beneath the beams of their own home. “Our nine children no longer have a mother. My best friend and soul mate is gone,” he said. “We need a house to live in and the sea has claimed every possession of ours except for the clothes on our back,” Patemosi said, when asked about the most immediate need for his family. In the aftermath of Cyclone Winston, much of Oelekuro village has been destroyed. Patemosi has built a makeshift shed to house his family. It has no windows except for an opening that serves as a door, and a mud floor with grass and leaves as a covering. Patemosi and his children eat with the others villagers who are still housed in the local community hall awaiting outside support to help them rebuild their village and their lives.